mung sprouts, originally uploaded by Seligmans Dog. I've been reading SproutPeople.com lately. Very cool site to buy sprouting gear. They also give plenty of information to sprout using a common glass jar too. 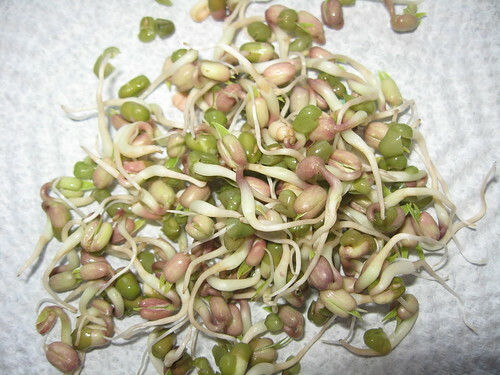 I made these mung bean sprouts starting last Sunday night. I sampled a few sprouts every day and I'm afraid I halted the sprouting process a bit too late. From day 1 through 3, they were more sweet. I grew them one more day and they were still good, but just lost some sweetness. They're really tasty and great for midday snacks (almost as good as Cheeze Its from the vending machine). Give sprouting a shot. Any legume or grain will do. I'm currently working on lentils (a mix) and garbanzo sprouts. Mung were good though. I'll be doing them again.